Skyfarm is a conceptual design for vertical farming to deal with growing population and limited space. Image: courtesy of Rogers Stirk Harbour + Partners. The structure will be made of light bamboo. Image: courtesy of Rogers Stirk Harbour + Partners. Skyfarm will integrate aqua, hydro and aero technologies to cultivate plants in a sustainable manner. Image: courtesy of Rogers Stirk Harbour + Partners. The design for Skyfarm is the recipient of prestigious awards including MIPIM Future Projects Awards 2016 and World Architecture Festival Future Projects 2014. Image: courtesy of Rogers Stirk Harbour + Partners. Skyfarm is a vertical farm design proposed by Rogers Stirk Harbour & Partners and Arup Associates. The conceptual design was awarded the sustainability prize at the Architectural Review MIPIM Future Projects Awards in 2016. It was also the winner in the Future Projects Experimental category in the World Architecture Festival (WAF) in 2014. Skyfarm presents farming in a new and innovative manner unlike the typical land-intensive method that is practiced today. The concept of a vertical farm that includes hydro, aero and aquaponic technologies best suited for high-density areas with limited space and low quality soil. The multi-storeyed proposal has been described as a ‘thorough, believable and beautiful project’ by the WAF jury. The concept for Skyfarm was developed as a research project for the Milan Expo held in May 2015. The universal exposition was hosted under the theme of ‘feeding the planet, energy for life’ and displayed ideas that integrated technology, innovation, culture, traditions and creativity with food. The idea behind Skyfarm is to secure food for a growing population in a sustainable manner. The project details how the global population is expected to increase by three billion people in the next 30 years and how more land will be required to continue with the traditional farming methods. The project proposes an innovative farming technique to sustain the growing population using the available resources in the best possible manner. The Skyfarm is a multi-storeyed tensegrity structure, where compressed membranes are isolated and the tower is delineated by pre-stressed tensioned membranes. Light bamboo is used to create the tower and give it a tight circular frame that will enable greater sun exposure on the farming zone. Rain water is harnessed at the top of the tower in large tanks and then supplied throughout the height of the building using gravity. The Skyfarm is developed as a zoned structure to utilise water and nutrients efficiently. Wind turbines located on top of the building that generate energy for the available mechanical systems. The different levels in the Skyfarm are designed to support different styles of farming, including cultivation and an aquaponics system. The aquaponics system allows crops and fishes to live together with the plants in a symbiotic environment where plants provide filters for the fish’s survival, while the waste from the fishes is used to feed the plants. "The different levels in the Skyfarm are designed to support different styles of farming." A meeting place will be created at the tower’s ground level in the form of a market or restaurant, which has been proposed in the design to promote public interactions and establish the Skyfarm as an educational hub, offering a glimpse of the cultivation activities being carried out. At the top of the public space will be a large, visible tank where aquafarming of freshwater fishes including bass, tilapia and barramundi will be carried out. 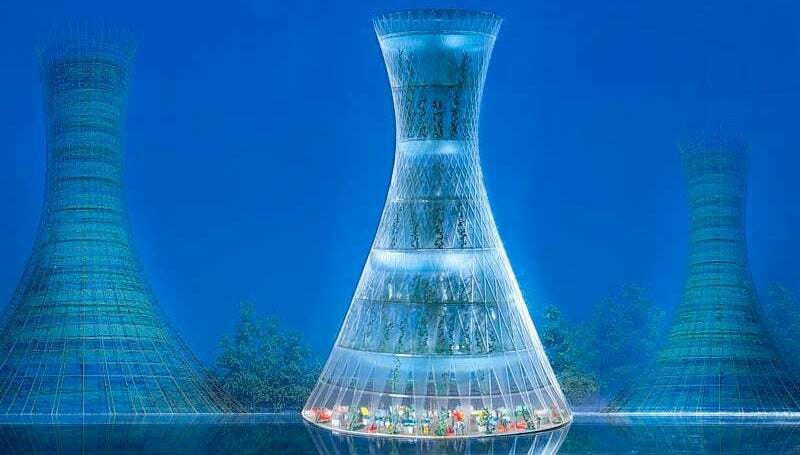 Hydroponics farming will occupy the middle of the tower with plants being grown in water rather than soil. Above the hydroponics section will be an aeroponic system, promoting cultivation in a misty surrounding to minimise the use of water, while being grown without soil. The hyperboloid structure of the tower is scalable and can be adapted for use either as a 10m building for smaller areas or an 80m-tall structure for larger areas. Geometry of the tower can also be altered according to the earth’s latitude and the availability of sunlight. To combat cooler conditions, the Skyfarm can be equipped with a double-skinned enclosure and heating options to provide for ideal farming conditions. The provision to cultivate products such as strawberries, spinach and lettuce all year round in close proximity to markets without any additional transport costs makes Skyfarm appealing option even though it is expensive when compared to regular farming.